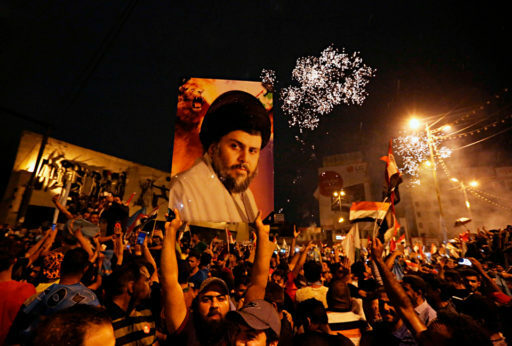 In Iraq’s recent parliamentary elections, the Sairoun (Forward) Alliance, whose main partners are the political forces of Shi’ite cleric Muqtada al-Sadr and the Iraqi Communist Party, won the largest number of seats. 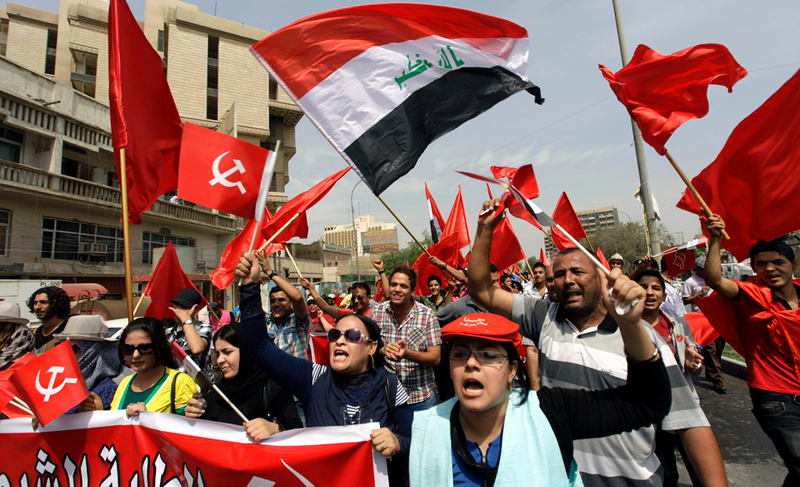 In the interview below, Salam Ali, the international secretary of the Iraqi Communist Party, explains how Sairoun came out on top. For further background, see earlier coverage in People’s World from David Bacon. What was special to this alliance that attracted the support of those participating in the election? The parliamentary election in Iraq a week ago propelled the Iraqi CP to one of the most visible forces in the media not only in Iraq but internationally. The Sairoun Alliance, a trans-sectarian electoral alliance which brings together forces loyal to cleric Muqtada al-Sadr, the Iraqi Communist Party, and other non-religious parties, has gained important results in this election. It won 54 seats (16.4 percent) out of 329 in parliament. The victory is the outcome of cooperation between democratic activists, including Communists, and the Sadrist movement in the popular mass protests that have continued since July 2015 against the corrupt political system of sectarian-ethnic quota-based power sharing. The Sairoun Alliance’s electoral program embodied the aspirations of hundreds of thousands of people who were looking for an alternative and an end to the sectarian politics that have had catastrophic consequences and even threatened the existence of Iraq itself. Sairoun called for building a civil state based on the principle of citizenship, where all Iraqis are equal irrespective of their ethnic, religious, confessional, or ideological affiliations. Combating the corruption—financial, administrative, and political—which is endemic in Iraq is also a top priority, as are tackling high unemployment, especially among young people, poor education and health, and reviving the national industrial and agricultural sectors. The electoral sloganeering of the ruling political blocs was exposed as empty words that can no longer deceive the people and the shameful record of the ruling elite has long been exposed, with about $300 billion USD of state revenues plundered over the past 13 years. When the current prime minister Haider al-Abadi took over from his predecessor Nouri al-Maliki in late 2014, he publicly revealed that he inherited empty coffers. Sairoun presented a concrete plan for combating corruption that includes enacting a host of legislative and executive oversight measures to bring to account those responsible. Reform of and rebuilding the state, providing security and stability, social equality, economic development, defending women’s rights, and support for culture were also key features of Sairoun’s political platform. One distinguishing feature of the alliance was its emphasis on upholding Iraqi national identity, building state institutions, and firmly rejecting foreign interference—both regional and international—in the country’s internal affairs. Ruling blocs have been shamefully subservient to foreign powers—the U.S., Turkey, Iran, and Saudi Arabia—serving their interests at the expense of Iraq’s independence and sovereignty, including direct interference in the formation of previous governments. Importantly, nearly 99 percent of the candidates fielded by Sairoun were new faces, individuals who had not previously held posts in parliament or government and were not tarnished by corruption and mismanagement. This was in contrast to the “old faces” of the ruling blocs, many of whom were not re-elected. Given that electoral blocs favored by the Islamic Republic of Iran (Hadi al-Amiri) and the U.S. (Nouri al-Maliki and Haider al-Abadi) didn’t do as was expected by their backers, could this be a starting point to significantly limit the influence and interference of external regional and global forces in Iraq’s affairs? Voter turnout was 44.5 percent—the lowest since 2006. In 2014, it was 60 percent. This is indicative of widespread resentment, disillusionment, and disaffection with the corrupt ruling elite and their policies and was particularly clear in areas that had been regarded as strongholds of Islamist parties—urban centers, Baghdad, and other provinces in central and southern Iraq. It is an important feature as it marks a change in political awareness and a movement away from identity-based and sectarian politics. Thus, boycotting the vote by these sections of the population was an expression of resentment—a protest vote. The State of Law bloc, led by Nouri al-Maliki, was the biggest loser, with its seats reduced from 92 in 2014 to 26 this time. The second biggest bloc, however, was Al Fateh (Conquest), led by Hadi al-Amiri, with 47 seats. Supported by members of the Popular Mobilization Units (Hashd al-Shaabi), it sought to capitalize politically on their role in the battle against the terrorist armies of ISIS. Prime Minister Abadi’s bloc, Nasr [Victory] Alliance came third, with 42 votes. As pointed out above, the ruling groups had opened the door to foreign interference in Iraq’s internal affairs, but, despite their electoral losses, they are not expected to give up their dominant positions of power or the enormous privileges easily or voluntarily. They will seek the support of their external backers in their political maneuvers in forming the new government. U.S. and Iranian high-level envoys Brett McGurk and Qasem Soleimani visited Iraq soon after the elections in attempts to influence this process. The U.S. and Iran continue to be major players in Iraq and the whole region, along with Turkey and Saudi Arabia. The recent escalation of tension as a result of Washington’s decision to pull out of the Iran international nuclear deal will further complicate the Iraqi political scene and impact on its stability and security. The Sairoun Alliance has openly rejected such blatant interference. It has stressed the need for a strong independent Iraqi national will, coupled with a principled and rational political discourse that would ensure good relations with all of Iraq’s neighbors based on mutual respect of national independence and sovereignty. Putting an end to foreign interference requires concrete steps to remedy the fragile internal situation and the strengthening the societal fabric and national unity. Are the Sadrists really committed to the slogans advocating a civil, non-sectarian, forward-looking democratic and federal Iraq? Muqtada al-Sadr seems to have reinforced his political position through this election and is being seen as the de facto leader of Sairoun Alliance. But as a leader of one of the largest Shia movements, would he be willing or capable to play an effective role in building a non-sectarian political system? On the political level, all the parties of the Sairoun Alliance have generally adhered to its program during the electoral campaign. In the aftermath of the elections, there is close coordination with regard to the next steps, dialogue, and negotiations with other blocs. These negotiations are still in their initial stage and are aimed at exploring a common ground regarding the formation of the largest bloc in parliament that would be assigned the job of forming the new government as there was no outright winner with a majority in parliament. Sairoun, as well as the leader of the Sadrist movement, Muqtada al Sadr, have reiterated their commitment to the election campaign promises. The alliance will not accept a return to sectarian-ethnic quota-based power sharing in the formation of the new government. It must be based on an anti-sectarian and anti-corruption platform, in line with basic tenets of Sairoun’s program. Agreement on the government program comes first, before discussing who would be the nominee to the post of prime minister and other details. If these objectives are not achieved, then, as already publicly declared, Sairoun will become the main opposition force in parliament. Its main components and the civil democratic forces will also continue to participate in the mass-protest movement against sectarian politics and corruption, defending human and democratic rights, and mobilizing for political reform and change. What is your assessment of the Iraqi Communist Party’s (ICP) performance in this election? According to news released, out of the 54-plus seats won by the Sairoun Alliance, only two were open members of the ICP. 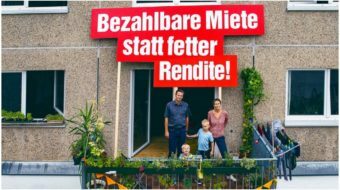 What were the key factors in limiting its winning more seats? Did this election coalition help the ICP attract more popular attention and visibility in Iraqi society? The party organized a big electoral campaign, inside Iraq and abroad, that had a positive impact on its status among the people and enhanced its political prestige. Party activists managed to reach remote areas and mobilize for the alliance as well as present the party’s views and analysis. It enabled party organizations and cadres to get closer to the popular masses, develop closer links, and build a solid base for future political work and campaigns in defense of fundamental democratic rights and for our national, democratic alternative. Two Communist candidates were successful. 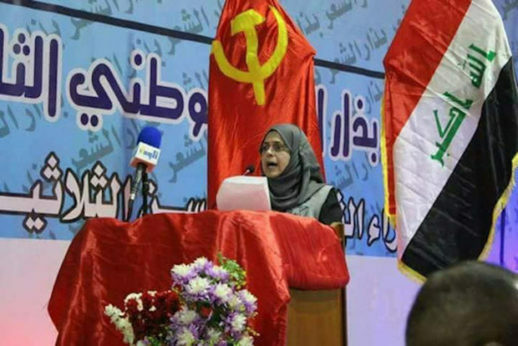 Comrade Raid Fahmi, the secretary of the ICP Central Committee, came second in Baghdad and Haifaa al-Amin came third in Thi Qar province in the south. Other Communist candidates were unfortunately unsuccessful, despite an effective election campaign. There were 58 ICP candidates in 14 provinces. Initial evaluation and assessment of the party’s performance and its election results indicate that the overall number of votes for its candidates has increased in comparison to 2014. A further analysis of the results, by the party leadership and all organizations, will help to identify weaknesses, as well as highlight successes and suggest new initiatives. This will also include the party media campaign, which worked hard despite limited resources and had to compete with ruling blocs that own dozens of TV stations and spend vast amounts of money on their publicity campaigns. As confirmed by independent and civil society monitors, the elections were marred by irregularities. and there were also accusations of manipulation of final vote counts by the Electoral Commission. This has taken place despite the introduction of electronic vote counting devices to speed up the process and prevent rigging. Serious questions were raised about the separate “special vote” for members of the armed and security forces who number about 700,000, as well as for Iraqi communities abroad numbering 179,000. It took a week to declare the final results. Two very important factors adversely affected the whole process. 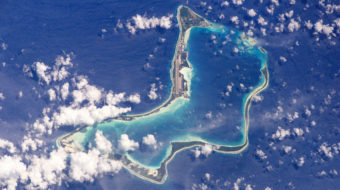 The first is the so-called Sainte-Lague system [it’s a highest quotient method for allocating seats in party-list proportional representation]. Despite a big campaign by civil democratic forces to amend it, the parliament—dominated by the ruling blocs—kept the same formula with a high threshold of 1.7 [a minimum percentage of votes required to be allocated seats]. The second, is the fact that the Electoral Commission itself was set up on the basis of the sectarian-ethnic quota-based system. It is therefore one of the priorities of the Sairoun Alliance, and of its agenda for a new government, to reform the whole electoral system, including the electoral law. How do you evaluate Ayatollah Sistani’s actions and role in this election? The role of the Shi’ite religious leader has been positive. Long before the elections, he distanced himself from the corrupt politicians in power and on several occasions declared, through his official spokesmen, his support for the just demands of the peaceful protesters in their demonstrations in Baghdad and other provinces across Iraq, against corruption and poor services. He also refused, in recent months, to receive any of the leading political figures of the ruling blocs at his house in Najaf, a sign of his disapproval of their policies. It is noteworthy that the message from Ayatollah Sistani before the elections that “He who was tried should not be tried again” was interpreted by his followers as advising them not to re-elect corrupt rulers. He also stated that it was up to Iraqi citizens to decide to vote or not. On previous occasions, he had preached that it was the duty of every Iraqi to vote, which was used by Islamist parties as a pretext to mobilize voters and legitimize themselves as defenders of the sect against its presumed enemies. Why was Sairoun successful and how has the experience of building alliances for election purposes affected the deep sectarian divide in Iraq? In addition to the factors contributing to the success of the Sairoun Alliance mentioned above, it was effectively the only new development in political alliances before the elections on May 12. All the other blocs were a product of previous alliances of sectarian and ethnic identities. Some even attempted to camouflage their real identity by adopting civic titles and slogans. Sairoun was also able to maintain its unity while other blocs suffered splits and fragmentation. 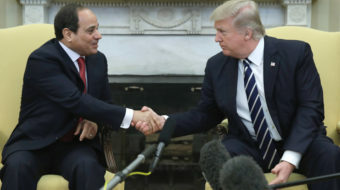 It can be said that this trans-sectarian approach has been a unique development in an otherwise bleak political landscape. The fact that it actually emerged from the mass protest movement adds to its political significance, as a grassroots dynamic in the formation of alliances. It has enhanced an all-encompassing Iraqi national identity and contributed to rebuilding Iraq’s national unity. Based on this coalition experience, would ICP consider continuing cooperation or further joint activities with the Sadrists and other coalition members, and, if so, on what platform? The party will continue to work with the Sadrist movement and other members of the Sairoun Alliance on the basis of its program which has adopted and clarified the demands of the popular protest movement. It also converges with our party’s national democratic program that calls for putting an end to the system of political sectarianism and establishing a democratic state based on the principle of citizenship and social justice. Achieving this objective requires new forces and alliances that can bring about a real change in the balance of forces. Therefore, the success of Sairoun, as a big trans-sectarian bloc of a national and civil character, is a first step in the struggle to break the existing monopoly of political power. The party will also continue to work with the Democratic Current movement and all other civil and democratic forces. This interview was first published in Farsi by Nameh Mardom, the newspaper of the Tudeh Party of Iran, on Monday, May 28. This is an edited version of an English translation that appeared in Morning Star. 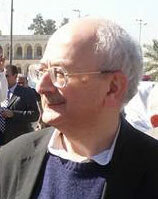 Salam Ali is international representative of the Iraqi Communist Party and a member of its Central Committee. He is based in the UK.